Thin, crêpe-style pancakes have a bit of a reputation for being tricky, but Hugh thinks that's because a lot of us only make them once a year. He likes to eat them with a light dusting of sugar and a squeeze of lemon juice, but he also tops them with sliced banana and honey, with fridge jam, or sometimes with a slosh of maple syrup. Sift the flour and salt into a bowl and make a well in the centre. Pour in the eggs, add about 50ml of the milk and start to whisk, gradually incorporating the flour into the wet ingredients in the centre. When you have a thick batter forming in the middle, add a bit more milk and whisk in a bit more flour. Keep going in this way until all the milk has been added, all the flour is incorporated, and you have a smooth batter, about the consistency of single cream. One of the mistakes people make with pancakes is to leave the batter too thick. So if your batter is still more double than single cream, whisk in a little more milk. You can also make the batter by whizzing everything up in a food processor. Either way, let it rest for at least 30 minutes, then check the consistency again. If it's thickened up a bit, add a dash more milk to bring it back to the right consistency. 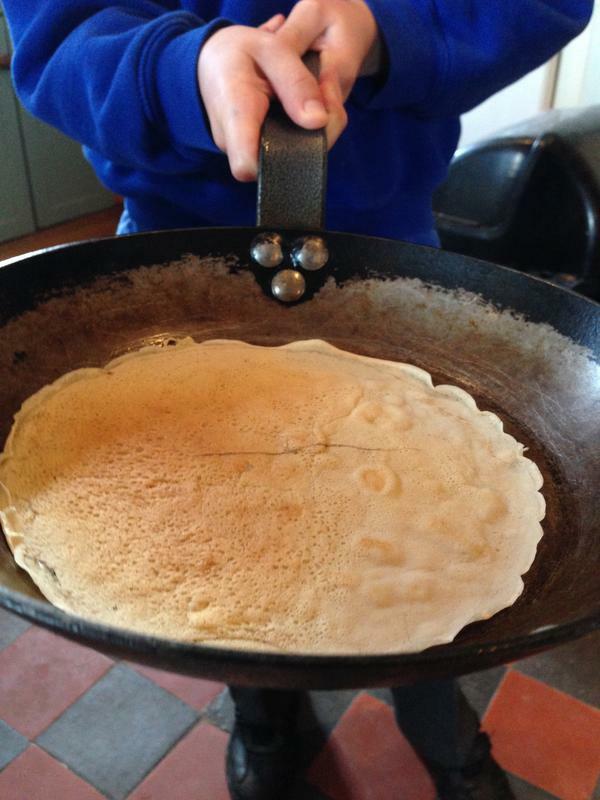 To cook the pancakes, heat a non-stick frying pan or crêpe pan, around 20cm in diameter, over a medium heat. When it's hot, swirl 1 tablespoon of oil around the pan, then tip out the excess. Add a small ladleful (around 50ml) of batter – just enough to coat the base of the pan – and swirl it around quickly until it covers the base. Cook for a minute or so, until lightly coloured underneath, then flip over and cook for a minute more. Depending on the pan, you may need to loosen the edges of the pancake with a palette knife before you flip. Almost without exception, the first pancake will be a bit rubbish. Don't worry, this is normal; the next one will be much better. Dole them out as you make them, so they can be eaten hot – sprinkled with caster sugar and lemon juice.